This high-pressure thermocouple is used for temperature measurement in industrial applications. 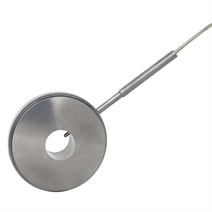 The thermocouple is suitable for the highest process requirements and enables reliable temperature measurement, for example, in plastics production and processing. Each TC90 is designed and manufactured in accordance with individual customer specifications. These instruments are manufactured using special manufacturing processes and, in order to ensure their quality, specific test arrangements and material tests are applied. This measuring assembly is sealed by means of metal-tometal sealing, high-pressure threaded connectors or sealing lenses, which have both proven successful over many years.